Wireless Solutions for School Administrators. As a school administrator, safety and productivity are always at the forefront of your day-to-day priorities. Having the ability to coordinate with staff members quickly and effectively, especially in an emergency situation is a must. There’s no better way to monitor and communicate with your staff than with wireless technologies. At ERS Wireless, we help schools implement wireless systems that offer instant communications. Technology that allows you to communicate seamlessly over various devices- two-way radios, smart phones, desk top computers, laptops, and tablets. Creating a wireless network that is robust and secure for e-learning initiatives is also important. The Wireless LAN’s we design provide reliable coverage and are very easy to expand as your schools’ needs increase. In addition to in-building connectivity, many schools are expressing interest in In-Bus Wi-Fi. This solution allows students to be productive while on their daily commute, or to an extra curricular activity. 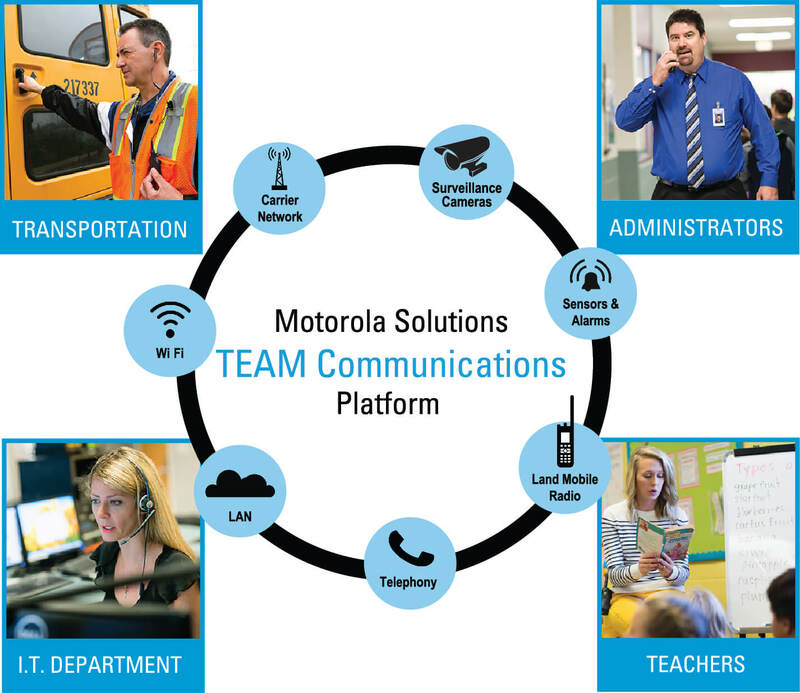 Whether you’re in the school, on campus, or off-site, with the Motorola Team Communications solution your staff will always be just a "push" away. TEAM Communications allows staff to use devices they already own – whether it’s smartphones, radios, computers or telephones – or you can equip them with a device that is right for their responsibilities and workplace. With this solution, they will have access to real-time information and other staff they need to do their job efficiently. All while your school leverages the devices and infrastructure you already have in place. Video camera systems can vary drastically- the clarity of images, video management software, bandwidth requirements, security, and ease-of-use are all things to consider before implementing a campus-wide camera system. At ERS Wireless, we are very pleased to offer schools surveillance solutions that help keep students, staff, and property safe. The surveillance systems we recommend offer clear images with powerful video management software, video analytics, and technology that significantly reduces bandwidth and storage needs. For student and driver safety and accountability school bus video has become common place in bus fleets and keeping that system operational is critical. Both interior and exterior cameras are designed to keep track of what’s going on in and around the bus while it is in operation. From student and driver behavior to motorists disregarding stop arm signals stay informed to keep students safe. At ERS we provide not only top name products we also provide top tier support as well. If you install bus video like most you know how important having it functional is, we provide professional installation services and functionality testing as well as on-demand repair and annual Preventive maintenance checks and report the results back to you. At ERS Wireless we understand how important technology has become and the more reliant we are on that technology the more critical the need for support. While some school systems have the staff, many do not or would rather not have them spend the time and resources to stay proficient in this ever-changing environment. Maybe you don’t want to risk buying something that is obsolete before you even get it installed or your needs change as you expand, add buses, build new classrooms or whatever the reason. With ERS Managed Services we take all of the worries out of your decision making by offering you and end-to-end solution that is flexible to meet your changing needs while avoiding the risk of being stuck with a bad purchase decision. With our Managed Service plan, there’s minimal upfront cost and you pay for your “Solution as a Service” over time, while having guaranteed uptime. Regardless if it’s a radio that needs repaired, a battery that needs replaced, or Wi-Fi Access Point that needs upgraded to the latest standard, we offer you a unique way to help your school stay connected.